This week marks the forty-first official edition of “Troop Interviews”, where a team of interviewers (currently are Amadeus23, Marija, Mariss, Jake, Litt, and Klein) ask two or more individuals questions. These questions that are asked may not be the same throughout each interview as it is wanted for each interview to be original and have its own unique highlights. Along with that, the questions asked are to achieve a better understanding of each rebel and how different/similar everyone is to one another. There are many rebels here in the Rebel Federation, as you may know, so it will be difficult to get to everyone who requests to be interviewed. 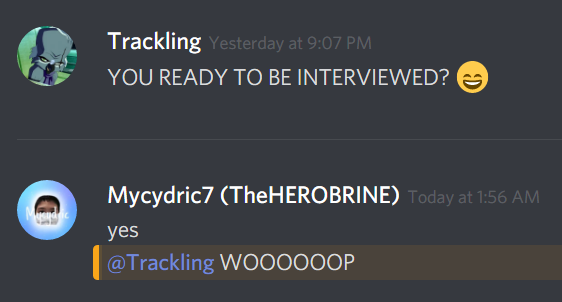 THE INTERVIEWEES FOR THIS WEEK ARE CINDY AND MYCYDRIC! Alllright rebels, we’ve got yet another interview post this week! SEEMS LIKE THERE’S SOME SORT OF “7” TREND THIS WEEK, CONSPIRACY THEORY??!!?! Well I hope you guys didn’t miss me too much… Anyways, here is Cindy77! She is born ready to be interviewed with her drums right there. Hopefully, Cindy doesn’t get blown away in storms because then who will provide us with fanfics??! A volleyballer…WHATA PRO!! Vb is fun with all them SPIKES and ACES. And obviously playing sports is 10x better than watching. hehehe ok ONWARDS. 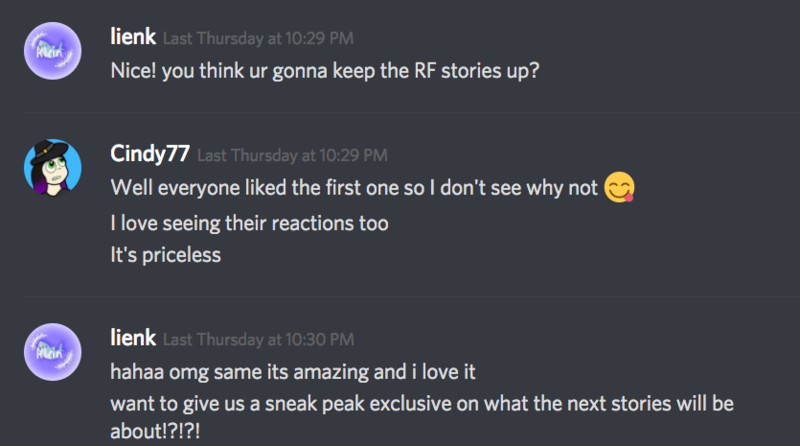 Awwww Cindy stayed on discord for RF and her friends HOW SWEEET! Cindy has some mad writing skillz that must be acknowledged! Her recent fanfics have made her the topic of discussion, with about 70 views! Cindy will keep up her stories for now because of the great reactions of the troops. Hopefully, she doesn’t get in trouble bc sometimes fanfics are awk! 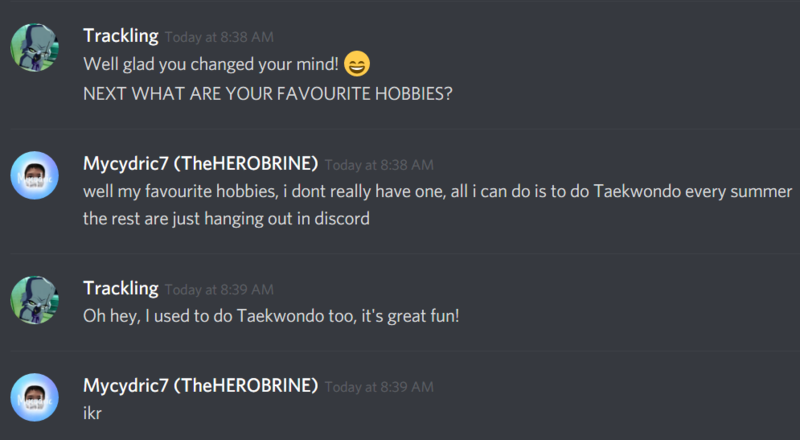 Mycydric’s fav hobby of all time is FRICKING TAEKWONDO!??! Geez don’t get in a fight with him because he’ll go all POW on you! Track might as well. wHaT iS AMbiTiON? 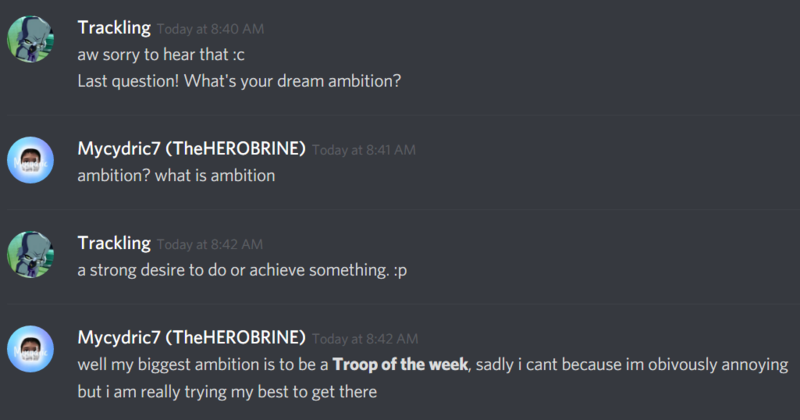 Mycydric really wants to be Troop of the week… I wish you best of luck on your endeavor Mycydric, keep up the HARD WORK and you’ll get there! 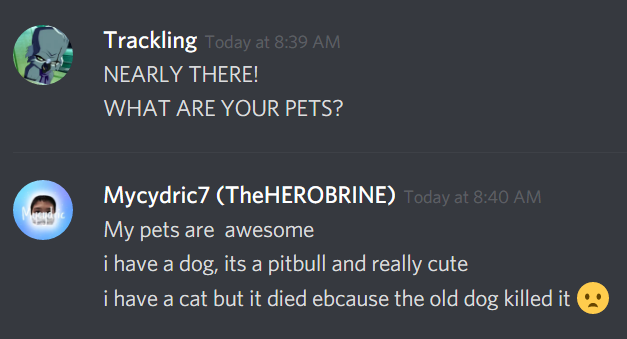 Of COURSE Mycydric is not annoying, THANKS FOR YOUR TIME! 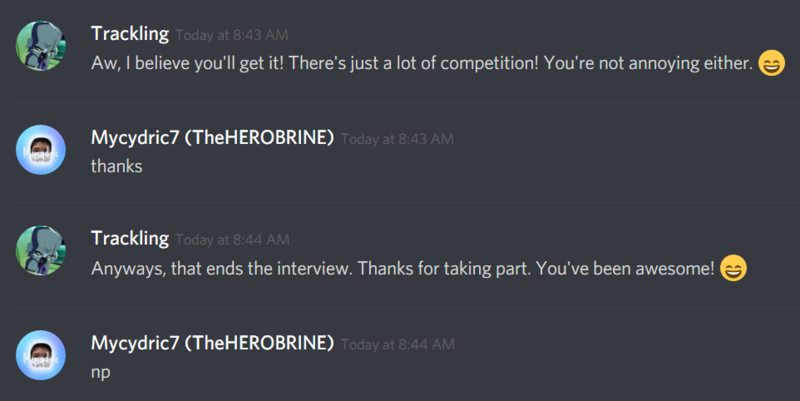 If you have any questions or would like to be interviewed by the interviewing team, DM one of these members: Litt, Amadeus, Marija, Jake, Mariss, or Klein.